The sound is made by shoes that have a metal "tap" on the heel and toe. There are different brands of shoes which sometimes differ in the way they sound. "Soft-Shoe" is a rhythm form of tap dancing that does not require special shoes, and though rhythm is generated by tapping of the feet, it also uses sliding of the feet (even sometimes using scattered sand on the stage to enhance the sound of sliding feet) more often than modern rhythm tap. It preceded what is currently considered to be modern tap, but has since declined in popularity. Tap dance has its roots in the fusion of several ethnic percussive dances, primarily African tribal dances and Scottish, Irish, and English clog dances, hornpipes, and jigs. Tap dance is believed to have begun in the mid-1800s during the rise of minstrel shows. Famous as Master Juba, William Henry Lane became one of the few black performers to join an otherwise white minstrel troupe, and is widely considered to be one of the most famous forebears of tap dance. As the minstrel shows began to decline in popularity, tap dance moved to the increasingly popular Vaudeville stage. Due to the two-colored rule, which forbade blacks from performing solo, the majority of Vaudeville tap acts were duets. This gave rise to the famous pair "Buck and Bubbles," which consisted of John "Bubbles" Sublett tap dancing and Ford "Buck" Washington on piano. The duo perfected the "Class Act", a routine in which the performers wore impeccable tuxedos, which has since become a common theme in tap dance. The move is seen by some as a rebuttal to the older minstrel show idea of the tap dancer as a "grinning-and-dancing clown." John "Bubbles" Sublett is also known famously for popularizing rhythm tap which incorporates more percussive heel drops and lower-body movements. Another notable figure to emerge during this period is Bill "Bojangles" Robinson who was a protégé of Alice Whitman of The Whitman Sisters around 1904 (then 'Willie Robinson'). Well versed in both Buck and Wing dancing and Irish Step dancing, Bill Robinson joined the Vaudeville circuit in 1902, in a duo with George W. Cooper. The act quickly became famous, headlining events across the country, and touring England as well. In 1908, however, the two had an altercation, and the partnership was ended. Gambling on his popularity, Robinson decided to form a solo act, which was extremely rare for a black man at that time. Despite this, he had tremendous success and soon became a world-famous celebrity. He went on to have a leading role in many films, notably in the Shirley Temple franchise. Shortly thereafter, the Nicholas Brothers came on the scene. Consisting of real life brothers Fayard and Harold, this team wowed audiences with their acrobatic feats incorporated into their classy style of dancing.They never looked less than suave and were always in total control of their dancing, even in childhood numbers such as ''Stormy weather''. A notable scene in the movie "Stormy Weather" features the pair dancing up a staircase and then descending the staircase in a series of leapfrogs over each other into a full split from which they rise with no hands. During the 1930s tap dance mixed with Lindy Hop. "Flying swing outs" and "flying circles" are Lindy Hop moves with tap footwork. In the mid- to late 1950s, the style of entertainment changed. Jazz music and tap dance declined, while rock and roll and the new jazz dance emerged. What is now called jazz dance evolved out of tap dance, so both dances have many moves in common. But jazz evolved separately from tap dance to become a new form in its own right. Well-known dancers during the 1960s and 1970s included Arthur Duncan and Tommy Tune. No Maps on My Taps, the Emmy award winning PBS documentary of 1979, helped begin the recent revival of tap dance. The outstanding success of the animated film, Happy Feet, has further reinforced the popular appeal. National Tap Dance Day in the United States, now celebrated May 25, was signed into law by President George Bush on November 7, 1989. 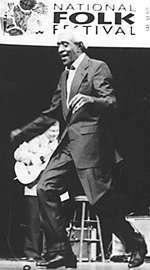 (May 25 was chosen because it is the birthday of famous tapper Bill "Bojangles" Robinson.) Prominent modern tap dancers have included Sarah Reich, Brenda Bufalino, Melinda Sullivan, The Clark Brothers, Savion Glover, Gregory and Maurice Hines, LaVaughn Robinson, Jason Samuels Smith, Chloe Arnold, Michelle Dorrance, Jason Janas, Sam Weber, Marshall Davis Jr, Heather Cornell, Dule Hill, Dormeshia Sumbry-Edwards and Dianne "Lady Di" Walker. Indie-pop band Tilly and the Wall also features a tap dancer, Jamie Pressnall, tapping as percussion. (video) A man practices tap dancing in front of a station in Japan. 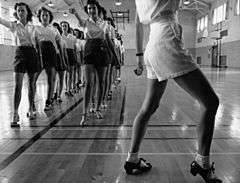 Tap dancing class at Iowa State College, 1942. Tap dancers make frequent use of syncopation. Choreography typically starts on the eighth or first beatcount. Another aspect of tap dancing is improvisation. Tap dancing can either be done with music following the beats provided, or without musical accompaniment; the latter is known as "a cappella" tap dancing. Hoofers are tap dancers who dance primarily "closer to the floor", using mostly footwork and not showing very much arm or body movement. This kind of tap dancing, also called rhythm tap, was employed by slaves in America. Because the slaves were generally not allowed to practice their own culture and customs, they mixed their form of dancing with Irish step dance to create tap dances that could be concealed from slave owners and over-seers. This is the origin of tap and what later evolved into (what most people know as tap now) "show tap" because it uses more arm movement. This form evolved because show tap was thought to be more exciting to watch and became famous when show tap was put on Broadway. Steve Condos developed an innovative rhythmic tap style that influenced the work of later tap dancers such as Gregory Hines and Savion Glover. The majority of early hoofers, such as Sammy Davis, Jr., Glover, Hines, and LaVaughn Robinson were African American men. Savion Glover helped bring tap dance into mainstream media by choreographing Happy Feet, a film about a tap dancing penguin. Another well-known tap film is 1989's Tap, starring Gregory Hines and many old-time hoofers. Early tappers like Fred Astaire provided a more ballroom look to tap dancing, while Gene Kelly introduced ballet elements and style into tap. This style of tap led to what is today known as Broadway style, which is popular in American culture. It often involves high heeled tap shoes and show music, and is usually the type of tap first taught to beginners. Examples of this style are found in Broadway musicals such as Anything Goes and 42nd Street. Common tap steps include the shuffle, shuffle ball change, double shuffle, leap shuffle, hop shuffle, flap, flap ball change, running flaps, flap heel, cramproll, buffalo, Maxi Ford, Maxi Ford with a pullback, pullbacks, wings, Cincinnati, the shim sham shimmy (also called the Lindy), Irish, Waltz Clog, the paddle roll, the paradiddle, stomp, brushes, scuffs, spanks, riffs, and single and double toe punches, hot steps, heel clicks, time steps, over-the-tops, military time step, New Yorkers, Shiggy Bops, drawbacks, and chugs. In advanced tap dancing, basic steps are often combined together to create new steps. Many steps also have single, double, and triple versions, including pullbacks, timesteps, and drawbacks. In tap, various types of turns can be done, including step heel turns, Maxi Ford turns, cramproll turns, and drag turns. Timesteps are widely used in tap and can vary in different areas. These consist of a rhythm that is changed to make new timesteps by adding or removing steps. Tap dancing can also be done using an a cappella method, in which no musical accompaniment is provided and dancers creating their own "music" through the sounds of their taps. In group tap dances, the steps are typically kept simple and easy to control. The group of dancers must work together to create the sound keeping their steps at the correct speed to match each other. In the earliest years of tap dancing, tap shoes often had wooden soles, but most tap shoes since have had leather soles. Today, it is common for manufacturers of tap shoes to also produce and fix taps. There are a variety of styles of shoe, the Oxford shoe being very common in jazz dance, and Mary Jane (shoe) is common for younger girls in tap classes. Tap shoe makers include Bloch and Capezio. Depending on manufacturer and model, tap characteristics can vary considerably. For example, some taps have relatively low weight and small footprint whereas others may be thicker and fill out the edge of the shoe more, making them heavier as a result. A tap's "tone" is influenced by its weight as well as its surface shape, which may be concave or convex. The tonal quality of a tap can also be influenced by the material it is made from, and the presence of a soundboard though there is some debate whether this affects the sound. Taps are mounted to the sole of the shoe with screws, and sometimes adhesive as well. The screws are driven into a soundboard – a thin fiberboard integrated into the sole that can be firmly "gripped" by the screws – to reliably attach the tap to the shoe. When no adhesive is used, the screws can be loosened or tightened to produce different sounds, whereas tonal quality is fixed when adhesive is used. 1 2 Gates, Henry Louis. "Harlem Renaissance lives from the African American national biography." Oxford University Press, 2009, p. 429. ↑ "Beginning Tap Dance: Learn the styles and aesthetics of tap dance". human-kinetics. Retrieved 2016-10-22. ↑ Thomas F DeFrantz (April 1, 2002). "Dancing Many Drums: Excavations In African American Dance". Univ of Wisconsin Press. ↑ David Hinkley, Gregory Hines (February 4, 2001). "HERE'S TO YOU, MR. ROBINSON". The Daily News. ↑ Hill, Constance Valis; Dunning, Jennifer; Hines, Gregory (2002-01-01). Brotherhood in Rhythm: The Jazz Tap Dancing of the Nicholas Brothers. Rowman & Littlefield. ISBN 9780815412151. ↑ Sarah Kaufman (December 17, 2006). "Tapping a Gold Mine of Motion". Washington Post. Retrieved December 16, 2007. ↑ "Grant Swift homepage". Retrieved 16 September 2010. ↑ "Dance: The rhythm of truth". March 21, 2007. Archived from the original on November 5, 2007. Retrieved December 16, 2007. ↑ Valis Hill, Constantine (2010). Tap Dancing America. Oxford University Press. p. 388. ISBN 978-0-19-539082-7. "Hoofer, a tap dancer who emphasizes movements from the waist down, and concentrates on the flat-footed percussive intricacies of the feet"
↑ "Customizing Your Tap Shoes: The Taps". Dance Advantage. 2011-07-05. Retrieved 2013-02-25. ↑ "Bloch Techno Heel Tap Shoes". Bloch. 2007-10-08. Retrieved 2013-02-25. Constance Valis Hill. Tap Dancing America: A Cultural History (Oxford University Press; 2010, 400 pages; Traces the history of tap from its origins in African-American and Irish forms. Seibert, Brian (2015). What the Eye Hears: A History of Tap Dancing. New York: Farrar, Straus and Giroux. ISBN 9781429947619. Wikimedia Commons has media related to Tap dance.